The Emily Carr String Quartet perform Haydn's string quartet op. 51, "Seven Last Words of Christ" at St. Andrew's Cathedral. Admission by donation. The Emily Carr String Quartet present "One More Way to See" on March 27th at the Dave Dunnet Community Theatre. Tickets:$25. The Emily Carr String Quartet present "Music in the time of World War II: 1939-1945. The program includes Barber's "Adagio" from his string quartet op. 11, Vaughn William's string quartet no.2 in A minor and Weinberg's string quartet no.5, op. 27. The ECSQ begin their 13th season with a concert commemorating the 100th anniversary of the first World War. The program includes: Suk, Meditation on the old Czech Chorale 'St Wenceslas', op. 35a, Bartok, String Quartet no.2, op.17 and Edward Elgar's String Quartet in E minor, op. 83. The Emily Carr String Quartet and guest host Robert Holliston explore Schubert's String Quintet in C Major. This presentation of "Music: Inside Out" features the first participant in the ECSQ's Young Artist Mentorship Program, cellist Sophie Van Der Sloot. The Emily Carr String Quartet present "Beethoven from Beginning to End" at the Sooke Harbour House's Copper Room. This concert features Beethoven's String Quartet op. 18 no. 3 and the great String Quartet in C sharp minor, op. 131. The Emily Carr String Quartet present "Beethoven from Beginning to End". This concert features Beethoven's String Quartet op. 18 no. 3 and the great String Quartet in C sharp minor, op. 131. Also on the programme is Jennifer Butler's "Klee Wyck Woman" for mezzo soprano and string quartet featuring Tasha Farivar (mezzo soprano) and text by Janet Marie Rogers. The Emily Carr String Quartet present "Music Inside Out: Smetana". Join the Emily Carr String Quartet and guest host Robert Holliston as they explore Smetana's String Quartet no.1 ("From my Life"). 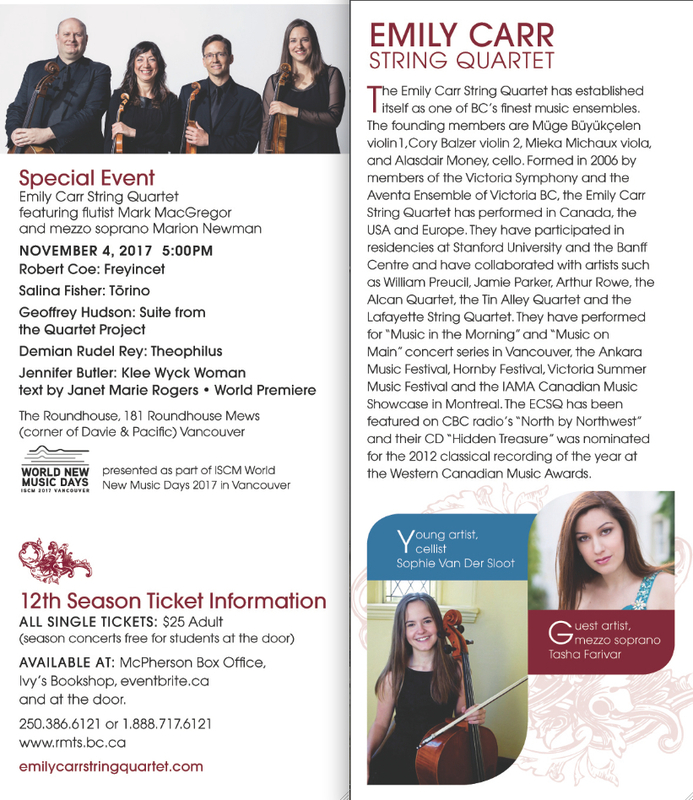 The Emily Carr String Quartet perform a concert of contemporary music for string quartet with special guest Marion Newman (mezzo soprano). The program includes "Freycinet" by Robert Coe, "Tōrino" by Salina Fisher, Geoffrey Hudson's "Suite from the Quartet Project", "Theophilus" by Demian Rudel Rey and a World Premiere of "Klee Wyck Woman" by Vancouver composer Jennifer Butler with text by Janet Marie Rogers. This concert is presented as part of ISCM World New Music Days 2017 in Vancouver. The ECSQ start their 2017/18 season with "Symmetrical Soundscapes" a concert featuring Bartok's String Quartet no.4, Haydn's String quartet op. 76 no.5 and "Tōrino" by New Zealand composer Salina Fisher. The Nanaimo Conservatory of Music presents THE 7TH ANNUAL VANCOUVER ISLAND CHAMBER MUSIC FESTIVAL VICMF Artistic Director Pippa Williams has carefully curated an eclectic and thrilling group of professional ensembles for the VICMF’s 7th season. Come and enjoy chamber music performed by professional artists in intimate settings! The concerts will take place on two days at two venues: • Friday 23 June | 7:00 pm | St. Paul’s Anglican Church Trio 211 & Emily Carr String Quartet • Saturday 24 June | 2:00 pm | Harbour City Theatre Victoria Brass & Ad Mare Reed Trio • Saturday 24 June | 7:00 pm | Harbour City Theatre Fringe Percussion & Marina Hasselberg/Cathy Fern Lewis. Friday, June 2nd, 7:30pm concert. Vox Humana presents: "The National Anthems". A celebration of the finest choral repertoire spanning over 500 years. Works by Orlando di Lasso, Carlo Gesualdo, Antonín Dvořák, Josef Rheinberger and from the composer of “the little match girl passion”, the British Columbia premiere of David Lang’s “the national anthems” accompanied by the Emily Carr String Quartet. In addition the choir is proud to present a newly commissioned work by Victoria composer Tobin Stokes. The Emily Carr String Quartet present "Music Inside Out: Mendelssohn" with guest host, Robert Holliston. Head of Keyboard studies at the Victoria Conservatory of Music, Robert Holliston will provide insight into the life and music of Felix Mendelssohn followed by a full performance of Mendelssohn's string quartet no.2, Op 13. During "Music Inside Out: Mendelssohn" There will be a silent auction presented by the ECSQ Society. To read more about The ECSQ Society's Silent Auction fundraiser click here. The ECSQ is looking forward to their upcoming concerts in March which will feature Janacek's second string quartet, "Intimate Letters" and Mozart's Clarinet Quintet with clarinet soloist AK Coope. To see the ECSQ's 2016/2017 season brochure click here. For a subscription form click here. The ECSQ Society is excited to present the Emily Carr String Quartet in “Kreutzer Sonata”; music of Janáček, Dvořák and Shaw. The ECSQ, in the first main concert of its 11th season will explore Janáček's first quartet; a work of uncommon intensity and emotion based on Leo Tolstoy’s novella “The Kreutzer Sonata”. Also featured is Dvořák’s beloved “American” string quartet, and Pulitzer prize winner Caroline Shaw’s Entr’acte. The Emily Carr String Quartet's 11th Season! Robert Holliston will be the host for our educational series, "Music:Inside Out" and versatile clarinetist AK Coope will join us for the Mozart Clarinet Quintet in our Main concert series. It is going to be an exciting season and we would like to share it with you! The Emily Carr String Quartet, now entering its second decade, will perform as part of Christ Church Cathedral's Summer Recital series. They will present a unique program of string duos and quartets, including Haydn's "Sunrise" quartet. Explore Claude Debussy with a morning of music, tea and insight into the fascinating life of one of the most prominent figures of Impressionist music. The Emily Carr String Quartet Society is proud to present "Music Inside Out: Debussy." Tea, coffee and refreshments, followed by discussion, analysis and a full performance of Debussy's string quartet in g minor, op.10 are included in the mornings program. Our host, Joseph Salem is Assistant Professor of Musicology at the University of Victoria. His current research interests include the criticism and analysis of non-notated music, the music of Pierre Boulez, and the divergent paths of European and American experimentalism during the middle of the twentieth century. Joe has also contributed research to the fields of opera and the history of music theory, and is an avid fan of critical theory and methodological critique. He has received fellowships from the Fulbright organization and the Paul Sacher Stiftung in Basel, Switzerland, for his 2014 dissertation, which critiques Boulez’s formative writings and works during the rise and fall of integral serialism. Music on Main presents: "One Night Stand: Caroline Shaw". Music on Main’s multi-faceted ‘Composer In Residence’ Caroline Shaw joins dancer Vanessa Goodman, pianist David Kaplan & the Emily Carr String Quartet for one magic night of art + song on May 10th. Violinist, vocalist, sometimes Kanye-collaborator & youngest-ever Pulitzer Prize for Music winner, Shaw is a musician whose work embraces immediacy and joy. This fantastic concert offers a chance to delve into her arresting, physical, and open-hearted work. 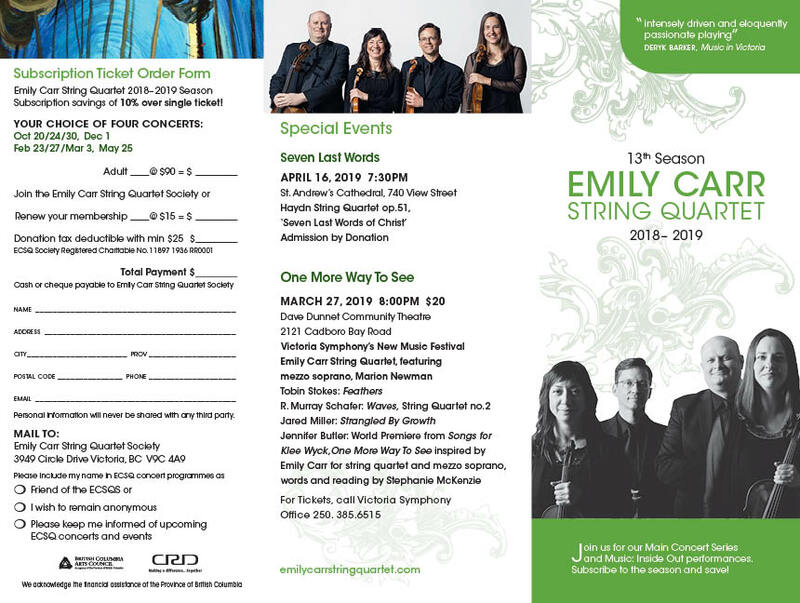 The ECSQ Society is thrilled to present a concert celebrating the 10th anniversary of the Emily Carr String Quartet with special guests the Lafayette String Quartet, superstar accordionist Jelena Milojevic, and a World Premiere by prominent BC composer Jared Miller. Joining forces for the first time, UVIC artists-in-residence the Lafayette String Quartet and the ECSQ will perform Mendelssohn's masterful octet and Shostakovich's haunting 2 pieces for string octet. Accordionist Jelena Milojevic, touted as one of the world's foremost accordion players, will also join the ECSQ to perform Adiós Nonino by Astor Piazzolla at this celebratory event. Jared Miller's string quartet "Strangled by Growth" is a signature work commissioned by the ECSQ with support from BC Arts Council. Inspired by artist Emily Carr’s painting "Strangled by Growth”, Miller’s work will receive its world premiere at this event. Jared Miller is presently composer-in-residence of the Victoria Symphony and recently listed as one of CBC's 30 hot classical musicians under 30. Open Space and the Vancouver Inter-Cultural Orchestra have come together to present Global Soundscapes: Notes from the Araxes Basin a festival featuring presentations of traditional, contemporary and inter-cultural music of the Middle East and Canada. Notes From the Araxes Basin promises to be a great musical adventure, guaranteed to expand horizons and transcend borders. This festival has events in Vancouver, North Vancouver, and Victoria. Victoria events include an instrument demonstration, a concert, and a workshop for composers. Music by contemporary Middle Eastern and Canadian composers, performed by Gevorg Dabaghyan, Neva Özgen and Navid Goldrick (oud) accompanied by Victoria's Emily Carr String Quartet. Featured composers include Ahmed Adnan Saygun (Turkey), Mohammad Taghi Massoudieh (Iran) and Vartapet Komitas (Armenia), as well as Mark Armanini, Rodney Sharman and Farshid Samandari. Demonstration: February 19, 2016 at 7:30 p.m.
Concert: February 20, 2016 at 8 p.m.
Workshop: February 21, 2016 at 1:30 p.m. Admission: Concert: $16/$11 in advance, $20/$15 at the door; all other events are by donation. The Emily Carr String Quartet present "Death and the Maiden". The program includes Britten's string quartet no. 2 in C Major, written for a commemorative concert of English composer Henry Purcell, a world premiere of Jocelyn Morlock's "Big Raven", an ECSQ commission based on the Emily Carr painting and Schubert's string quartet no.14 in d minor entitled "Death and the Maiden". Renowned conductor and music educator Timothy Vernon will provide insight into the life and music of Maurice Ravel followed by a full performance of Ravel's string quartet. "Music: Inside Out" will take place at The Art Gallery of Greater Victoria on Saturday September 26, 2015 at 10:30 am. The Linden Singers welcomes the Emily Carr String Quartet for the debut performance of ‘Gloria’, a newly commissioned work for strings and choir by Jeff Enns, ‘Ubi Caritas’ by Ola Gjeilo and other works. Explore Wolfgang Amadeus Mozart with a morning of music, tea and insight into the fascinating life of one of the most prolific and influential composers. The Emily Carr String Quartet in partnership with the Art Gallery of Greater Victoria are proud to present Music Inside Out: Mozart. A look into Mozart’s life and music takes place on Saturday May 23, 2015 at 10:30 AM. Tea,coffee and sundries, followed by discussion, analysis and a full performance of Mozart's String Quartet K.575 are included in the mornings program. Renowned conductor and musical educator Maestro Timothy Vernon will host the event. Timothy Vernon is the founding Artistic Director of Pacific Opera Victoria and has conducted every major orchestra and Opera company in Canada. Maestro Vernon has been honoured for his work by receiving The Order Of Canada. Steinway Artist and critically acclaimed pianist Lorraine Min will be performing with the Emily Carr String Quartet in concert at the Philip T. Young Recital Hall UVIC Apr. 24 7:30 pm, and St.Mary of the Incarnation in Metchosin Apr. 26 2:30 pm. The concert will feature a chamber version of Chopin’s stunning Piano Concerto No.2 , a work recently recorded by Min and the ECSQ. The program will also feature Tan Dun’s Eight Colors for string quartet, and Goddard’s Allaqi. Lorraine Min’s live recording session of the 3rd movement of Chopin’s Piano Concerto No.1 with the Emily Carr String Quartet can be heard on Youtube https://www.youtube.com/watch?v=qAkfoT9oVwU. The Emily Carr String Quartet perform Crumb's "Black Angels" as part of Music on Main's(Vancouver) "Roam" concert series. The program also features "Tenebrae" by Osvaldo Golijov. 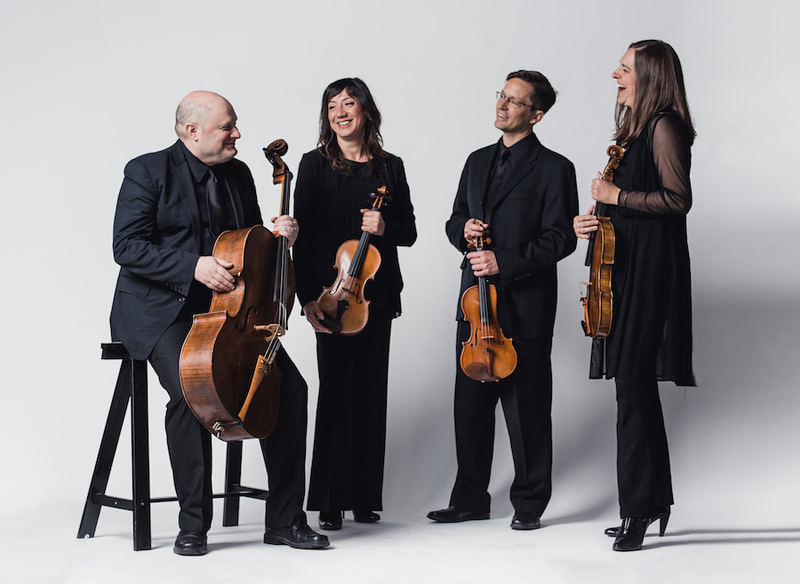 The Emily Carr String Quartet perform as part of the Victoria Symphony and University of Victoria's New Music Festival featuring the work of Gerald Barry. Irish composer Gerald Barry is the focus of this year’s New Music Festival. Explore the unexpected and wacky genius of his music and delve into other modern works created to exhibit the lighter side of life. “Barry’s is a world of sharp edges, of precisely defined yet utterly unpredictable musical objects. His music sounds like no one else’s in its diamond-like hardness, its humour, and sometimes its violence.” -Tom Service, UK Guardian, January 2013 Many of his works have been commissioned by the BBC and include music for orchestras, chamber orchestras, voice and opera. He has a reputation of creating music independently of its instrumental medium, recycling concepts from piece to piece like adapting violin to piano or soprano voices to tenor. Thursday, March 5 / Uvic Sonic Lab • Friday, March 6 / Vox Humana• Saturday, March 7 / Victoria Symphony • Monday, March 9 / Emily Carr String Quartet. Open Space and the Vancouver Inter-Cultural Orchestra (VICO) are proud to present three events as part of the Chrysanthemums and Maple Leaves 2014 here in Victoria. This innovative festival organized by VICO celebrates the music of Japan, and explores interactions between Japanese and Canadian cultures through educational events, workshops, chamber recitals and orchestral concerts in Vancouver, Victoria and Burnaby. Victoria will be welcoming three master musicians from Japan and the Netherlands: Naomi Sato (sho), Bruce Huebner (shakuhachi), and Miyama Tokita (koto). The events in Victoria begin with an instrument demonstration and recital of traditional music at the Greater Victoria Library on October 24, at 3:30 p.m. This even will provide an introduction to the instruments of sho, shakuhachi and koto. On October 25, at 1:30 p.m. emerging composers will present sketches and pieces written for these instruments. This event, a composer's reading session, will take the format of an open rehearsal. This will be an excellent opportunity to not only to learn about the instruments, but will provide insight into the compositional process. Feel free to drop by for the whole afternoon or just a portion. To finish off the events in Victoria, Naomi Sato, Bruece Huebner, and Miyama McQueen-Tokita will be joined by the Emily Carr String Quartet to show case new works for traditional Japanese instruments. Explore Ludwig van Beethoven with a morning of music, tea and insight into the fascinating life of one of the most prolific and influential composers. 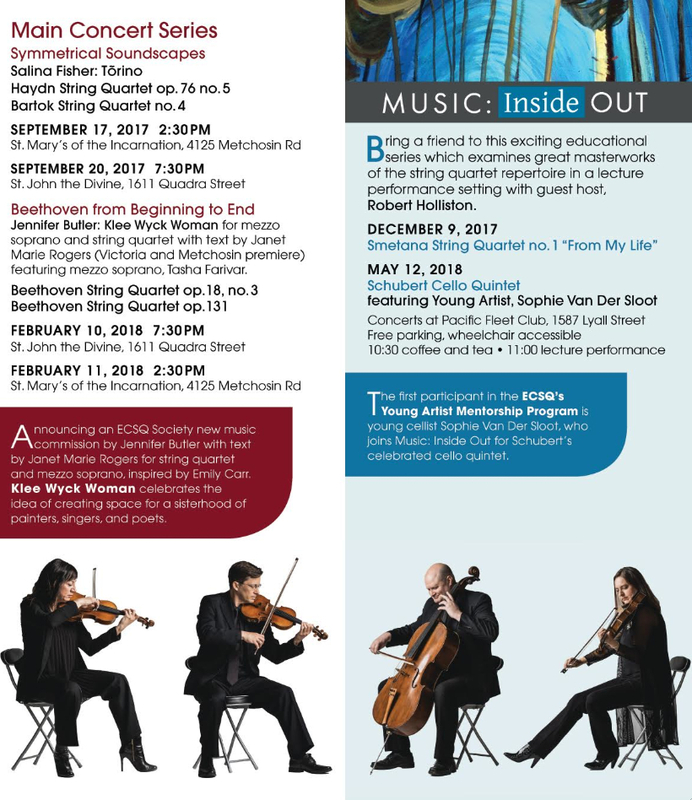 The Emily Carr String Quartet in partnership with the Art Gallery of Greater Victoria present "Music Inside Out: Beethoven". Tea/Coffee and refreshments, followed by discussion, analysis and a full performance of Beethoven's string quartet Op. 74 "The Harp" are included in the mornings program. Renowned conductor and musical educator Timothy Vernon will host the event. Timothy Vernon is the founding Artistic Director of Pacific Opera Victoria and has conducted every major orchestra and Opera company in Canada. Maestro Vernon has been honored for his work by receiving the Order of Canada. The Emily Carr String Quartet are going ahead with a concert of Canadian works inspired by Emily Carr. The concert will take place in May 2014 and will feature Jean Coulthard's "Pines of Emily Carr", movements of Tobin Stokes' "Stories from Klee Wyck" and a new string quartet piece by Tobin commissioned by the ECSQS with the assistance of the Arts Council of British Columbia. Join the Emily Carr String Quartet at the Art Gallery of Greater Victoria for a morning of music, tea and insight into the life of Franz Joseph Haydn. Music Educator and CBC radio guest June Goldsmith will be your host; entertaining and enlightening you as we explore Haydn's fascinating life and his Emperor String Quartet. Coffee, Tea and sundries at 10:30 followed by discussion, analysis and a full performance of Haydn's String Quartet Op 76 No 3 ''Emperor" by the Emily Carr String Quartet. Following the concert, audience members are welcome to take a guided tour of the Art Gallery. June Goldsmith is a musician, educator, and founder of Vancouver's Music in the Morning. June is a regular guest on the CBC radio one program North by Northwest and has been honoured for her work in music receiving both The Order Of Canada and The Order of British Columbia. "Tobin Stokes is working on a new piece for string quartet, inspired by the writing of Emily Carr. The piece was commissioned by the ECSQS with the assistance of the Arts Council of British Columbia. "The ECSQ is excited to present their new website. Big Thanks to Veronica Trujillo and Peter Michaux for the design and implementation. Special Thanks to Barb Mcdougall for all the quartet photos!" 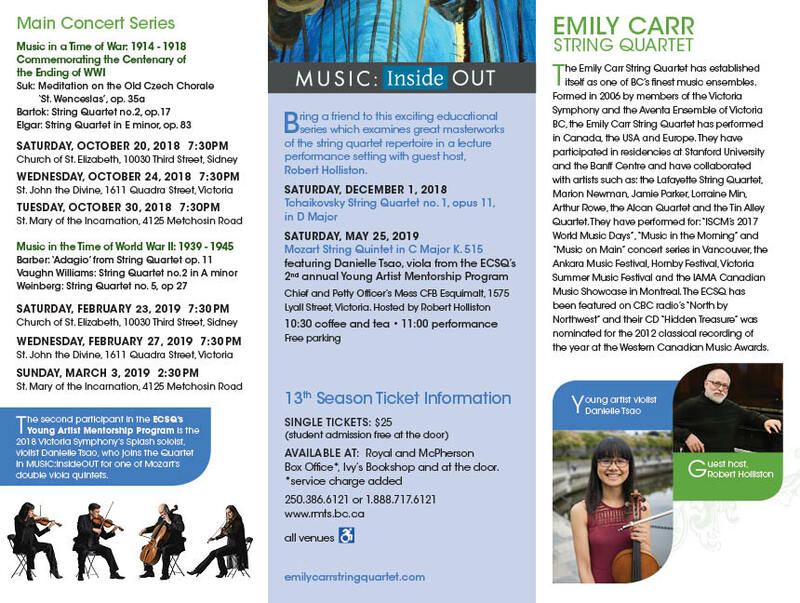 The Emily Carr String Quartet Society was formed on April 16, 2012 with the mandate to support the Emily Carr String Quartet in the promotion, performance, education and recording of the string quartet repertoire from classical to contemporary. The ECSQ Society also provides assistance with the commissioning of new Canadian compositions and collaborations with distinguished artists.